There’s gum on this cupcake, and we don’t mean gum paste! (Sorry, cake decorating joke). 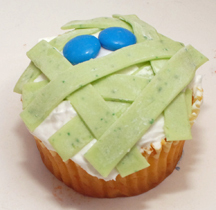 Gum from a roll makes the wrapping on this not-so-scary mummy. What You Need: 1 cupcake (baked and cooled); white frosting; white or light green rolled gum; two blue M&Ms. Make That Cupcake! : Frost cupcake white. Unroll section of gum. (Our gum was wider than we liked, so we used scissors to cut it in half lengthwise). 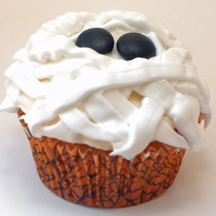 Cut gum into various lengths and lay over top of cupcake, leaving space for 2 M&M eyes. You can lay the gum in longer-than-needed strips and trim with scissors while on the cupcake if you’d like. Add eyes and there you have it!